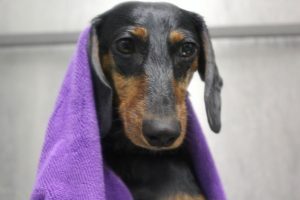 Our state-of-the-art grooming salon provides a premium, spa-like experience for your dog. Preserving your pet’s overall health and wellness with regular and proper grooming is made easy with hands-on, high-quality services. Our salon also offers great amenities to tailor the experience for your pet and lifestyle. 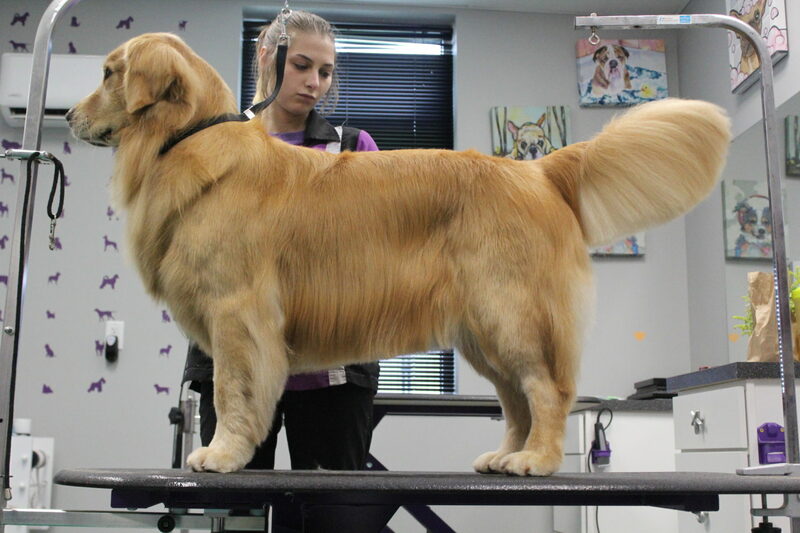 Our Salon is AKC Salon S.A.F.E., meeting or exceeding standards that promote safety and consistent education. 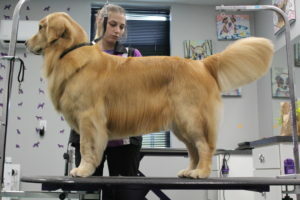 We’re one of the few Nash certified and AKC S.A.F.E grooming salons in Ohio. Come to see the difference – drop by for a tour during our business hours. No appointment necessary! We take health and safety very seriously and only want the best for your fuzzy family member. Please review our vaccination requirements and call us today to schedule! Our Deluxe Bath is a premium service that offers a wide range of the best shampoos and conditioners, giving your pet stylist the ability to choose the perfect treatment tailored to your pets needs. Let us know if your pup needs a haircut and style as part of their service when you make your appointment! We recommend scheduling your dog’s service every 4 to 6 weeks. Just Need A Nail Trim & File? We’ll do it for just $10. Our pet stylists recommend that dogs get their nails trimmed and filed every 2 to 4 weeks! Our Flea and Tick Shampoo repels fleas and ticks without the use of any harsh pesticides. With ingredients derived from plants, this shampoo is safe for pets and humans. This is not a preventative service. We always recommend a monthly flea treatment, even during the winter months. *If fleas are found during the course of service, we are obligated to perform our all natural De-Flea bath treatment at an additional charge. A non-irritating, moisturizing shampoo and conditioner that is ideal to promote healthy skin and coat. Reduces the excess shedding of loose hair. Enriched with Omega Fatty Acids, Vitamins, and Plant Extracts to help protect against excess shedding of loose hair. *Price Range $10-$20 depending on coat type and size. Quick and effective at fighting stubborn skin conditions associated with yeast, bacteria, and other microorganisms. It is a mild, moisturizing formula that is even safe to use on puppies! * We always recommend to see your veterinary service provider in regards to skin conditions. Some conditions require more in-depth treatment. If your doctor has prescribed you a medicated shampoo and they wish to have our stylist use it during the service, we will be more than happy to accommodate your doctors request. Mobility Mud is a stimulating and energizing treatment with the perfect amount of peppermint & menthol for joints to feel cool, refreshed, and rejuvenated. Our 20 minute massage will be helping your arthritic pet get some relief from aches, pains, and soreness that can cause serious discomfort or inflammation in their bodies. Peppermint oil is a natural antiseptic and has scientifically proven therapeutic properties. Say “goodbye” to itchy and “hello” to healthy skin! *Price range $25-$45 depending on coat type and size. Hot spots, blemishes, irritations, and other canine dermatitis conditions cause pain, tenderness and sensitivity. Soothing Mud is designed to promote healthy skin while combating canine skin problems such as allergy, sensitive, inflamed, itching, blemishes, tenderness, bacteria, and hot spots. Soothing Mud uses mineral rich clay with high concentrations of colloidal oatmeal and nourishing, healing ingredients such as organic aloe vera powder, green-tea, lavender, and witch hazel. These time-tested skin care ingredients promote healthy cell regeneration, ease irritation related to itchy and scratchy skin. Our relaxation massage will target tension spots commonly found in your pets spine, head and shoulders. Price Range $25-$45 depending on coat type and size. Add partial dye to your pet’s coat: paws, legs, tail, ears, lion head, or a Mohawk! This service is an add on to a Deluxe Bath or Haircut and Styling package. Please call ahead to discuss this service with your groomer and make sure we have your desired color in stock. *Pricing for this service will be based on the color design. Pet friendly nail polish is a fun addition to any of our deluxe packages! With a patented, water-based formula, Polish Pens are non-toxic, easy to apply, and guaranteed to make any dog look fabulous!